Weather station setup at Norris School District - Get live data on your phone. 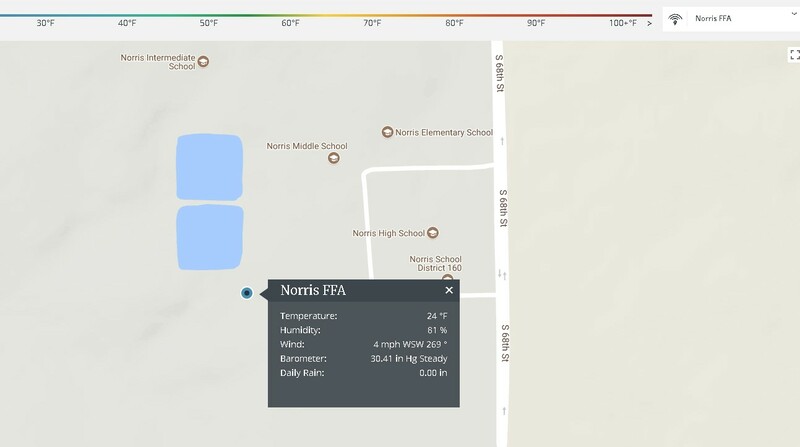 Want live and historical weather data for the Norris area? Due to a grant obtained by the Norris FFA Chapter, now you can! Norris FFA member Gus Whipple along with FFA advisors Dr. Krystian Harms and Mr. Colin Kubik were instrumental in applying for the grant. This Governor's award of excellence grant, sponsored by NIFA- Nebraska Investment Finance Authority, was presented to 15 FFA chapters throughout Nebraska. Bryan Williams, Norris Network Administrator, set up the new station that feeds data to the WeatherLink network as well as NOAA and Weather Underground. Data from the station is available on the WeatherLink.com website as well as iOS and Android apps. You will want to create a free account and add this station to your list.